What’s it like to star in the hottest new family sitcom? Bradley Steven Perry, 11, sure knows. He plays mischievous 10-year-old Gabe Duncan in Good Luck Charlie—premiering this Sunday, April 4, at 8:30 p.m. ET on the Disney Channel. The show follows sibs Teddy, PJ and Gabe as they adjust to their new role: babysitters for their newborn sis Charlotte (AKA Charlie). While mom Amy returns to work as a late shift nurse and dad Bob carries on with his pest-control business, the three become very hands-on with raising the cutie, learning how to balance school and regular kid life with ’sitting. Our fave thing about Gabe? The ridiculous antics he always finds himself in as he tries to maneuver the transition from being the family baby to the daunting rank of (gasp!) middle child. GL: Share some facts about your character, Gabe. Bradley: He is always trying to find food because his parents are always gone at work or taking care of the baby. He kind of feels neglected. He used to be the special kid [in the family] because he was the youngest, but then the new baby came along. He wants his spotlight back. What’s your favorite thing about him? I can relate to him because I’m like that. He has three other siblings, I have three other sisters. I just like playing him because he’s so funny. What’s the best piece of advice your sisters have given you? Just like what a girl would want. Like, don’t be mean to a girl, and all that stuff. They are all teenagers and they know what to do because they’re girls. [They’ve also helped] me like when we got the same teacher one year [in school] and they knew what to do because they used to be in that class. They kind of teach me what happened before I was that age. Gabe is very mischievous. What is the biggest prank you have ever played on somebody? It was 2 a.m. and I had a Halloween costume on, it was Davy Jones from Pirates of the Caribbean so it had all these tentacle things coming off it, and I went in my sister’s room. She gets really scared of that stuff. It’s funny because she always likes to watch scary stuff but gets really scared. Jason Dolley stars on the show with you. What’s one thing people might be surprised to know about him? He’s very, very good at Wii and Facebook games. She’s a good student in class. I’m in school with her [on set] the whole time. And she’s very good on the guitar. She plays it a lot. Be sure to catch Bradley when Good Luck Charlie premieres this Sunday, April 4. Then, let us know your thoughts. 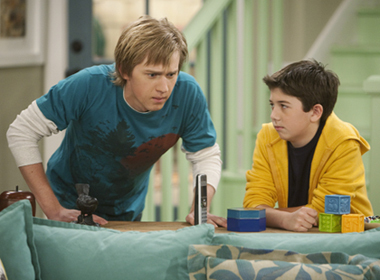 Want to hear more from Good Luck Charlie’s Jason Dolley? Check back tomorrow to see what the funny guy has to say. Are you excited for the show’s premiere? Blog about it, babes.